Fallout 76 review: "Just as worn as the world it depicts, without any of the warmth"
Fallout games have always been about survival. Everything outside the Vaults is rusty, broken, or just plain mutated - but hey, that’s the new normal. You get used to the dirt, you get used to the ruins, and you gradually become a hardened survivor who makes the Wasteland their home, finding pockets of warmth and humanity - and, importantly, humans - that keep you going. But unfortunately Fallout 76 is just as worn as the world it depicts, without any of the warmth. Although there are glimmers of the old Fallout twinkle, like tongue-in-cheek quests about the old-world bureaucracy and genuinely moving backstories about the impact of automation on the working class, Fallout 76 lacks the heart and dynamism of previous installations in Bethesda’s series. And I cannot put into words how sad it makes me to write that. "Fallout 76 lacks the heart and dynamism of previous installations in Bethesda’s series." Because one of the biggest questions I have when I’m playing is this: who am I surviving for? In the end, who is all of this for? Everyone is dead. Sure, there are robots, but unlike Curie from Fallout 4 or even Victor from way back in Fallout: New Vegas, these robots have the emotional depth of a toaster. Even the main robotic character you’ll interact with for a significant chunk of your main quests, a modified Miss Nanny called Rose, is sporadically three-dimensional. How she came to be created is a tragic story of grief and fury, but it’s only hinted at in the later stages of her numerous quests and a holotape you can find near her. Like with the rest of Fallout 76, her potential largely goes unrealised. While robotic NPCs could have been Fallout 76’s grand reveal (which would have nicely complemented the ever-present backstory of robots stealing people’s jobs before the bombs fell, by the way), the automations you come across are vendors, guards, or just ornamental greeter bots. You’re left feeling truly alone. Well, almost alone. Fallout 76’s growing community shines as brightly as the flash before a mushroom cloud. Running through Appalachia I’ve made a handful of friends after teaming up with them for an entire evening, waved till my in-game arms got tired, and dished out my fair share of heart emotes. Almost everyone I’ve run into has been friendly, and I still get that burst of glee when I find another survivor in the wasteland as even after hours upon hours of playing the novelty of multiplayer still hasn’t worn off. Just helping someone take down some Scorched or dropping a few free Stimpaks for a fellow explorer gives you that feeling of solidarity and that is, without a doubt, one of the best bits about Fallout 76. Something very special is growing in the wilds of Appalachia: a level 60 player gifted me some free fusion cores and later on I in turn helped out some newbies take out some ghouls. With a PvP system that disincentivizes killing unwilling participants, I’ve personally found there’s a cycle of helping each other out that should tempt even the most MMO-averse gamer. But I know I don’t speak for everyone, and friends of mine have had first hand experience of the less...let’s say hospitable side of fellow survivors. "There’s a cycle of helping each other out that should tempt even the most MMO-averse gamer." Regardless of whether you’re playing solo or with friends, you’ll probably still get a sense of déjà vû. Appalachia is built using the same Creation Engine as Fallout 4 and Skyrim, so most of your surroundings look uncannily similar to 2015’s trip into the Wasteland. Simply put: it’s old, and it shows. Textures take that crucial couple of extra seconds to load even when you’re up close, in third person your character looks like it was built out of an upmarket mannequin, and your enemies have the same kind of rigidity. Even after the beta I’ve seen foes T-pose and glide towards me in combat, I’ve had bits of rock and leaves turn neon green as they fail to load, I’ve clipped through objects, found broken quests, and over two days the game has crashed on me three times. With 2018’s games like God of War, Spider-Man, and Red Dead Redemption 2 making waves with their exquisite graphics - or even Horizon Zero Dawn way back in 2017 - the Creation Engine just isn’t up to scratch. There’s no other way to say it. The rare exception to that rule is The Mire and Cranberry Bog, the two most noticeably new areas that are unlike anything seen in Fallout before, rampant with lush life and weird new creatures. The Mire is a swamp thick with leafy trees and sentient vines that have infected local fauna, with grass so tall and thick that it that partly obscures your vision when sneaking. Cranberry Bog is just plain alien. Bright crimson bulbous trees spring from the ground and the dirt is a violent red, fitting considering the area is joint toughest to explore along with The Mire. That feeling of wonderment and wariness, the way you look constantly over your shoulder when you’re exploring them for the first, sixth, or twentieth time to look at the moonlight falling through the swampy trees or watch the ground deepen into the colour of wine at night (and to keep an eye out for enemies), that’s the feeling you want for the entirety of Fallout 76. Paired with the mutations you can develop, plus the new hunger and thirst meters, these areas show that the world you once knew is gone and that you’re fighting for survival. Just like the monsters, there’s still that trademark Fallout ingenuity when it comes to some of the quests (yeah, some of them...more on that later). The nonchalant sci-fi weirdness Fallout is famous for still fights on in the sidequests: hilariously frustrating bureaucratic procedures still being enforced by robots despite their office being rubble around them, a secret society of vigilantes lead by a stuntwoman/actress, the public events that simply ask you to watch a long-gone parade or help out a robotic mayor pick up beer bottles at the local shooting range. Plus in most nooks and crannies there are letters from people long dead, holotapes left by the first people to try and make Appalachia home, skeletons left in poses that range from poignant to just plain disturbing. You feel how places were alive once upon a time. But not anymore. Dead bodies of raiders, settlers, and responders are scattered in cabins and camps, a painful reminder that you’re too late to help. Without NPCs, the emotional connection that makes all that survival worthwhile is seriously lacking. Every main storyline quest you pick up has a foregone conclusion: you’re [insert faction name here]’s last hope. Whether that’s the Brotherhood of Steel, the Responders, the Free State, or even the formally-hostile Raiders for god’s sake, it always comes down to you helping to rebuild or find out what happened to the group (spoiler: no human NPCs means they’re all very, very un-alive). Boy, does that get emotionally exhausting. It doesn’t help that with no NPCs to add emotional weight to what you’re doing - fetch a holotape from here, go find this definitely-dead person there - most of the quests are transparently fetch quests. Alright alright, granted that all that chat with NPCs even way back in Fallout 4 might be just dressing up a fetch quest, but at least you felt like you were doing the quest for someone, that someone cared if you made it back. It’s hard to make a terminal or a pre-recorded holotape sound like it cares, as those are often the things you’ll turn your quest in to. "Fallout 76 lacks the life that made the post-apocalypse a beacon of hope in previous games." Fallout 76 is like meeting up with an old former friend you haven’t seen in forever. At first you’re ecstatic to see them and hear about everything they’ve been up to, but as the conversation goes on you realise that they haven't changed that much, but you've grown up. A lot. Just like a former friend, Fallout 76 has some new quirks, but they mostly serve to show how out of date the rest of the game is. What it comes down to is that in Fallout 76 you don’t just want to survive - you want to live. With its temperamental quests, technical issues, and out-of-date engine, Fallout 76 lacks the life that made the post-apocalypse a beacon of hope in previous games. Yet when it pushes into new territory, sometimes literally like in the case of The Mire or Cranberry Bog, or presents you with brand new enemies, you see some of the spark that makes Fallout... well, Fallout. If only there were enough sparks like that to set Appalachia on fire. But there aren’t. 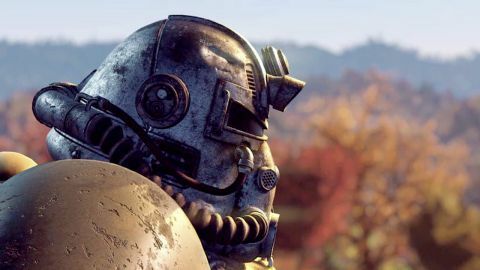 Remember: as it’s an MMO, there’s the real possibility that just like Elder Scrolls Online the Fallout 76 of today is going to be very different to the Fallout 76 of next year, so while it’s not worth jumping into Appalachia right now, spend some time in your own personal Vault and emerge again when the radioactive dust has settled. I’ll be updating this review in a month to see how things have changed, and then again next year as Fallout 76 hopefully continues to grow and adapt, just like the Dwellers of Vault 76 running through its world will.